The all-new Nesco Large Jerky Kit is all about making healthy and calorie free dishes in a less time. It will make all delicious and healthy snacks for you anytime, anywhere. The kit includes all the needed tools for you to prepare nice jerky sticks and strips. 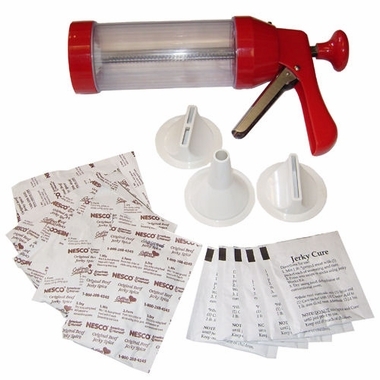 Offered with various jerky seasoning packs, it features a jerky gun with stainless steel trigger, a ratchet bar and a visible meat chamber which has the ability to handle a pound of ground meat. Three attachments are provided to choose to create jerky strips, sticks or double strips instantly. In addition to this, 5 jerky spices and cures are enough to prepare 5 pounds of meat for making jerky. It is absolutely simple and easy to use and is great choice for those who want to eat healthy and delicious jerky. The third time we used the jerky gun the clear cylinder cracked. This little gun really performs. It is very easy to take apart and clean which is perhaps the most important feature for any tool or appliance. With the wide barrel, it is also very easy to load. It does hold a full one pound of ground meat with seasonings. It took me about 2 passes onto the dehydrator tray to get the hang of squeeze, pull and stop. The seasoning packet and cure make a pretty tasty jerky. I do prefer my teriyaki style marinade on cut strips, but the gun and packets is so much easier and faster than cutting and marinating then dehydrating. I might try the wide tip and make some fruit leather strips next. Recommend this for slim jim type snack sticks especially.